I came across Genetos yesterday, but didn’t get around to playing it until today. I’ve never been a big fan of shumps, because I get easily confused with all of the bullets/items/enemies/objects/debris flying across the screen the whole time and Genetos does not differ from that formula. But none the less it has an interesting theme; it “evolves” through the stages in shump history. You move to the next stage by collecting all of the dropped items (differs depending on stage) that your enemies drop that slowly fill a bar. 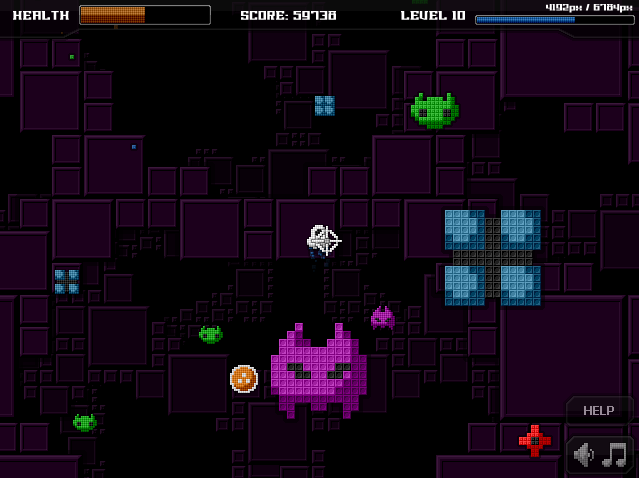 Some stage are obvious, like the first screen shot that is easily recognizable as a Space Invaders clone. But others are well…confusing like the second one. The weapons also evolve with the player, starting with your standard Space Invaders lasers to weapons that clear the whole screen. Later in the game it takes another turn and seems to switch to its own Genetos style theme. There is text that appears across the bottom suggesting a sort of story line to go along with the game, but it was hard to read the text and avoid all the bullets at the same time. All in all this is an interesting mash-up, though sometimes you lose your ship amongst the chaos on screen.